Sandra, thanks for the coaching. Your down-to-earth approach and concentrating on the basics was what I needed to get my confidence back, and your ideas about how to raise my profitability and get the Income in faster were great. I really loved your “Income Planning Drill” we did together as it opened my eyes to new possibilities and allowed me to see some mistakes I was making. Really great stuff! This software and the training are great! It has cleared up a lot of my questions about managing money. I am relieved I can be in control of my finances in an efficient way with a little effort on a weekly basis. I have attempted budgeting many times, but what I finally learned using this cash flow management software is that I wasn’t using the budgeting correctly or finishing the financial cycle and I would get confused and give up. With Sandra’s tools the debt can finally stop and I feel like I am in control of my financial future for the first time. Awesome program! I’ve had difficulty keeping in the discipline of cash flow control because I didn’t have the proper tools. This cash flow management software program pulled it all together for me and helped me take full responsibility for my financial condition. In the beginning I had to force myself to spend the 2 hours doing the video training and the 30 minutes a week working in the software to allocate my income properly, but I’m in my 6th week and it is now fun to see my progress and know I am on the right track. I am already seeing progress on paying down my company’s credit card debt and putting little bits of cash aside for things I need to keep my company solvent. I will survive! Finances have been a troublesome area of my life forever – whether I had plenty of money or not I felt a lot of anxiety about money. Thanks to your cash flow management software program and training materials I now know I have a simple, workable tool to use to control my cash flow and stop the worrying! WOW! What an eye opener! The information I learned about cash flow management shook me to my core, but now I can see the light at the end of the tunnel and I am getting out of debt…finally! 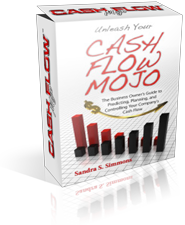 This cash flow management software and Sandra’s coaching has opened the doors to possibilities for growth and expansion in my business for the first time in years, especially the information on how to research new streams of income for my business. After talking with Sandra I realized how straight-forward and simple cash flow management is to understand. I have had the software for some time but didn’t use it because I thought it would be hard to do and take a lot of time. I was wrong! I started using the software immediately and it really is so simple. I finally can control my cash flow and feel confident that my business will succeed financially. Thank you for creating this software for us business owners! I had the cash flow management software for quite some time but I didn’t confront actually using it at all. I tried to get someone else to use it for me but that didn’t work, so I finally decided to use it myself. The software is so simple to use and understand I felt silly for putting it off, and there is so much customer support it is amazing. Thank you for the wonderful cash flow management software that is so easy to understand. While I had been aware that I needed to manage my business cash flow for years, I never really understood how to do it. As a designer I never took a course in managing a business or business finances. Your software makes managing my cash flow extremely easy to do. Thank you!